I just love this time of year. My spring garden is overflowing with herbs and baby lettuce of various shapes and colors. One of my favorites is an old Austrian heirloom romaine named Forellenschluss. In English that translates into, "speckled like a trout". With it's lime green leaves delicately dotted with red, it's a real beauty! The seeds are available from Cooks Garden, a company I've been ordering from for many years. I particularly like their seed mixes which contain several varieties in one package. Needless to say, we've been eating lots of salad around here lately. This one featuring Copper River Salmon has been a real hit. It pairs well with the Green Goddess Dressing that I lightened up with yogurt. Believe me, no one will be able to tell the difference. Season the salmon with salt, pepper, or your favorite rub. Roast it in the oven or cook it on the grill. I often grill it on a cedar plank. See post here. Cool to room temperature, flake and set aside. Steam potatoes until they are fork tender. Season with salt and pepper. Set aside to cool to room temperature. Steam or boil fresh corn. When cool, remove the kernels with a serrated knife .Set aside. Trim the tough ends of the asparagus. Grill or steam and set aside to cool. Arrange lettuce on a large serving platter. 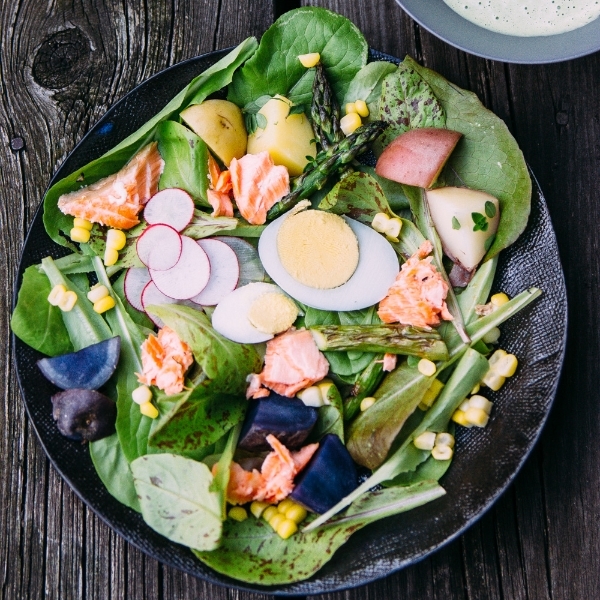 Top with potatoes, radishes, asparagus, eggs, corn, and salmon. 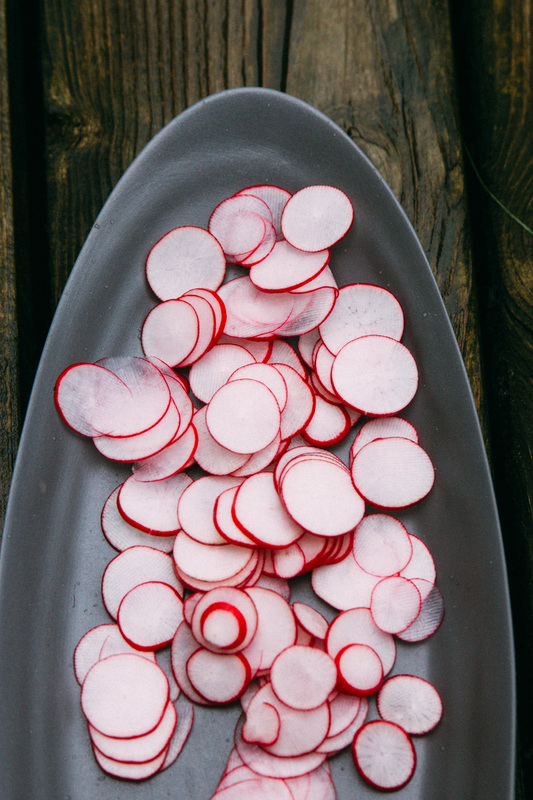 Right before serving, toss with Green Goddess Dressing or serve it on the side. Into a blender add the yogurt, mayo, lemon juice, anchovy paste, salt, pepper, and 1 cup of the basil leaves. Blend until smooth. Taste and adjust lemon juice if necessary. Add remaining 1/2 cup of basil leaves and blend.